Crews picking up litter along a Scioto County roadway. The Scioto County Commissioners have declared war littler and have committed to find ways in increase litter collection and bring awareness to the issue. Recently the Ohio Department of Transpiration (ODOT) said in 2015 nearly 400,000 bags of trash were collected along Ohio roadways. The 400,000 bags of trash collected equate to 10 bags for every lane mile of state, U.S. and interstate routes in the state. 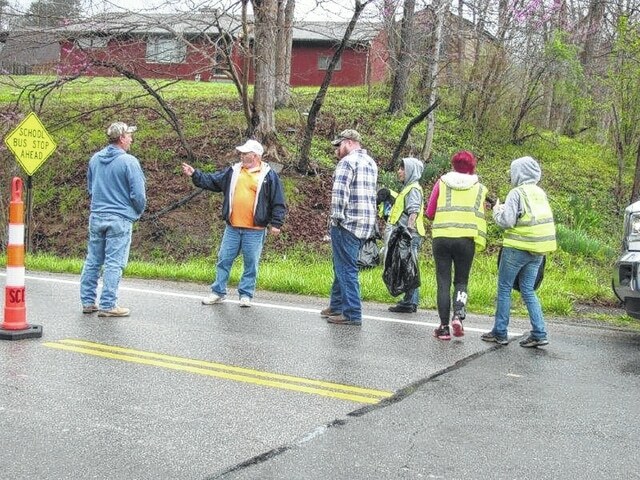 Nearly every day, in Scioto County Jeff Crippen, Litter Control Crew Supervisor, takes a crew out to county routes to clean up litter. Bryan Davis, Scioto County Commissioner said the only way to reverse this littering trend is, for residents to take more pride in their community. Davis along with Scioto County Commissioners Mike Crabtree and Doug Coleman said litter and open dumping, is something that can’t be tolerated any longer. Of the 400,000 bags of litter picked up 2,147 of the were in Scioto County at a cost of $18,626.02. To pickup that amount of trash ODOT annually spends $4 million a year picking up trash. According to ODOT that money could purchase 28 new snow plow trucks or pave a 28-mile, two-lane road. ODOT has an Adopt-A-Highway programs where groups can sign up to clean a two mile section of highway, committing to clean the space at least four times a year. Several groups locally have signed up to be a part of the program including, Tau Kappa Epsilon Fraternity, Delta Sigma Phi Fraternity, Lucasville Masonic Lodge #465, Boy Scout Troop #43, Kiwanis Club of Lucasville, Scioto Co. Juvenile Probation, Joe Reynolds Family, Minford Lions Club, Employees of Washington Nile School, Johnson Family, STAR Community Justice Center, Edgewood Manor of Lucasville, Church of Jesus Christ of Latter Day Saints, Western Sun Lodge, Friends of Scioto Brush Creek, Shawnee State Univ SGA, Life Ambulance Service and Delta Phi Epsilon. On average, Adopt-A-Highway volunteers pick up 25,000 bags of trash, saving ODOT $280,000. The Lawrence Scioto Solid Waste Management District has a recycling program in place in which a large number of items can be disposed of properly. Acceptable recyclable items include, papers (newspaper, office paper, magazines); aluminum cans (beverage cans); steel cans (soup cans, etc. ); plastic # 1 (beverage bottles); plastic # 2 (milk & juice jugs, liquid detergent bottles, trash bags, etc. For more information about the Lawrence Scioto Solid Waste Management District visit, www.lsswmd.org. Groups wanting to adopt a section of highway or an interchange can apply at: transportation.ohio.gov/litter.